Take a look at some of our favourite vegan recipes and see just how flavourful dishes free from animal products can be. 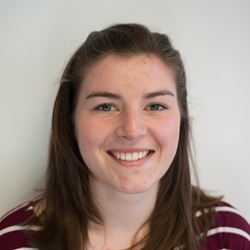 Harriet is Events and Partnerships Manager at Great British Chefs. Whilst those who have embraced a vegan diet know well how varied and exciting their food can be, many still see a life without animal products as bland and uninspiring. We’re planning on changing that with this list of fifteen utterly delicious recipes – which just happen to be vegan, too. Whether you’re vegan or not, with these dishes in your repertoire you’ll be able to whip up some seriously tasty meals. With everything from burgers to a seriously fruity crumble cake in the list, we’ve covered all the bases to get you started. 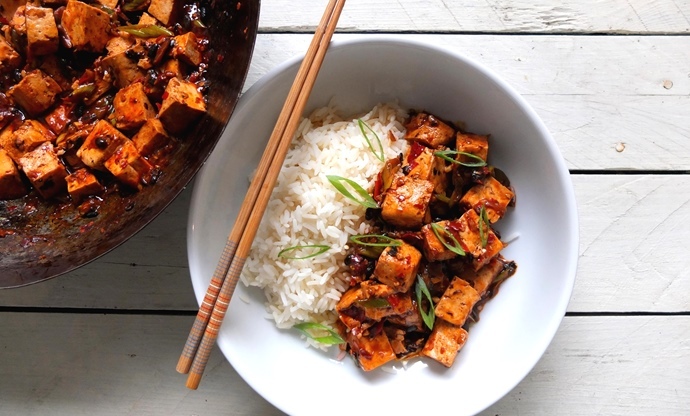 Tofu can be a divisive ingredient with a bit of a bad reputation but this deeply umami Mapo tofu is the recipe to convert the sceptics. 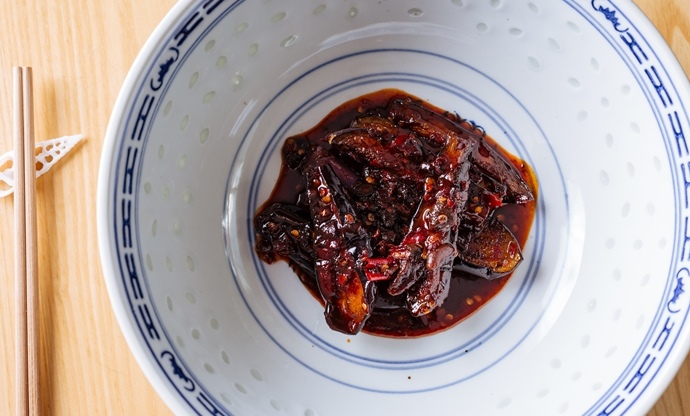 With a fiery, slightly numbing kick from Sichuan pepper and an intensely savoury note delivered by fermented black beans, flat flavours are something you definitely won’t be complaining about. Serve with plain white rice and a garnish of fresh spring onion to banish those greasy Chinese takeaway cravings. Swap out the porridge oats for pearl barley ahead of tomorrow’s morning meal for a creamy breakfast bowl which makes the most of the slightly sweet nuttiness of this lesser-used grain. Kate Doran even outlines the method for making your own hazelnut milk, which brings a delicious richness to this dairy-free delight. 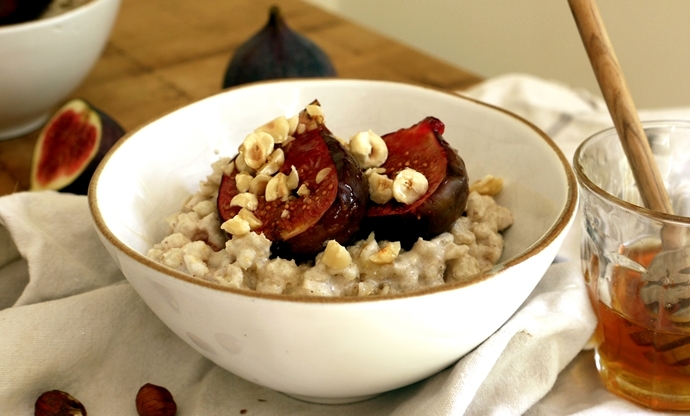 A little bit of spice and sticky baked figs bring this breakfast dish up to the next level; just replace the honey with some agave syrup to go full vegan and if figs aren't in season, try any of your favourite fruits instead. Tea and biscuits go hand in hand and Monica Shaw’s rosemary-flavoured creation might just become your new favourite dunker. 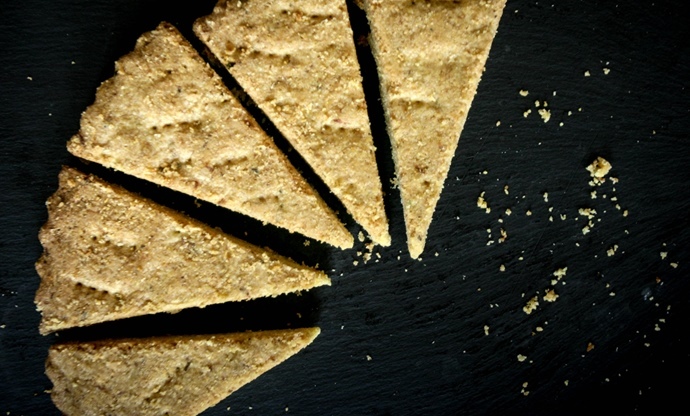 This shortbread is brought together by the ingenious inclusion of olive oil which works wonderfully in this sweet, zesty and herby treat. You can try to make these last a couple of days but realistically they’ll be gobbled up within hours! 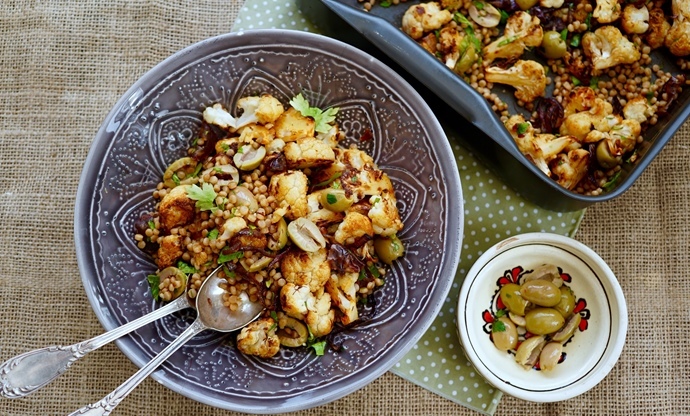 Elly McCausland has whipped up a taste sensation for this dish which brings together punchy olives, sweet dates and spiced roasted cauliflower. 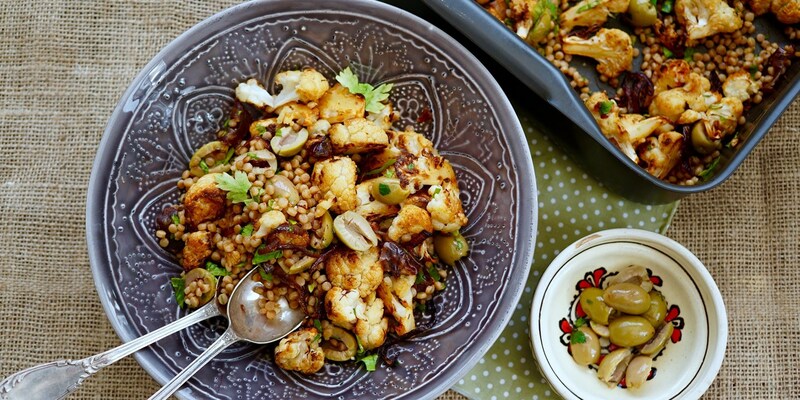 Sardinian fregola pasta is the perfect base for this summery salad although if the mood takes you, try swapping it out for giant couscous. Take a bowl of this outside to enjoy in the garden and bathe in the conveniently vegan deliciousness. When it’s warm outside a salad becomes the go-to for an easy midweek meal and Shu’s Sichuan-inspired noodle dish, packed with crunchy and refreshing cucumber, ticks all the boxes. 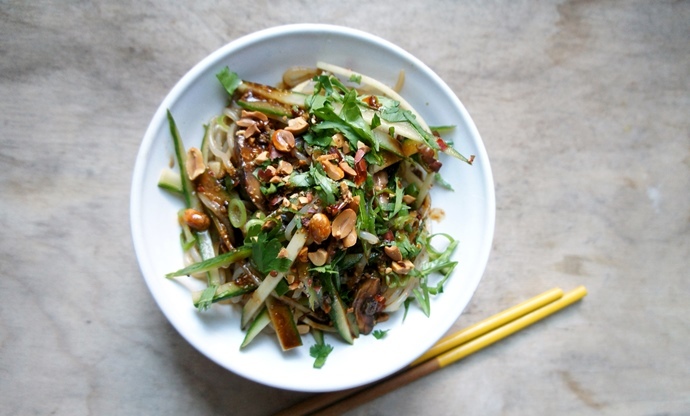 The noodles bring a slight chewiness and the flavour is set alight by a fiery Sichuan peppercorn-packed dressing that’s finished with the crunch of peanuts. It also doesn’t hurt that you can have it on the table in under half an hour. 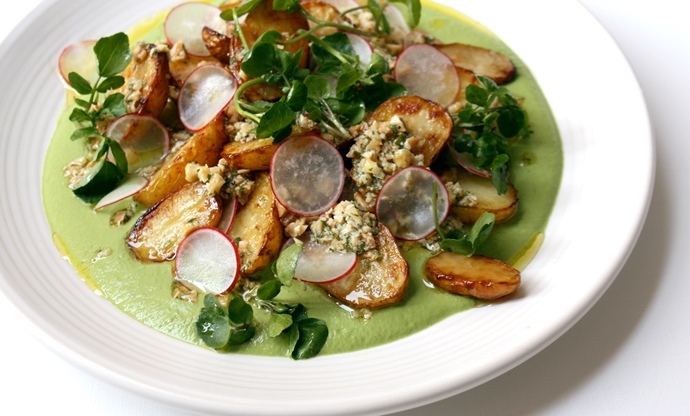 Joey O’Hare’s potato salad does away with the typical dollop of mayonnaise and introduces marmite and watercress instead. However, this salad still delivers creaminess in the form of a cashew and tarragon dressing which brings a hint of aniseed to contrast with the umami-coated potatoes. Perfect for a summer dinner party! 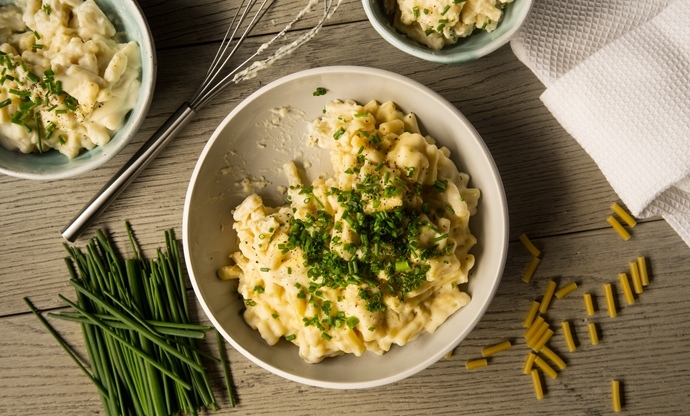 Macaroni cheese is one of those favourites which vegans think they have to give up when they ditch the animal products, but Jacqueline Meldrum has found the solution with her ingenious recipe. By replacing the butter and milk with dairy-free alternatives in the cheese sauce, this recipe manages to recreate the ultimate comfort food without skimping on the creaminess. And that cheesy flavour? Nutritional yeast solves that in just a couple of teaspoons. 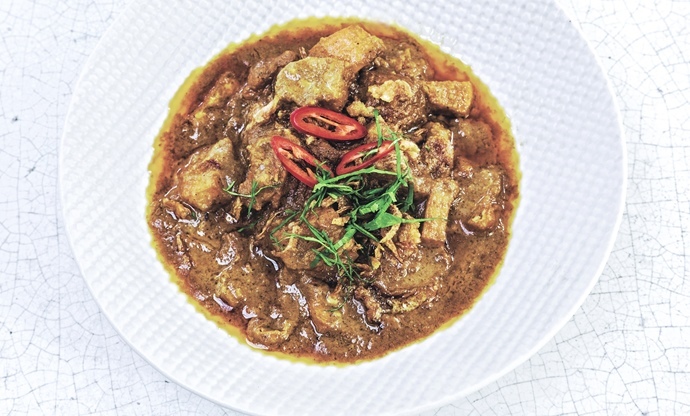 You may well have been saved by David and Charlotte Bailey’s sumptuous Massaman curry at various festivals across the UK when the mud has just got too much. Now you can enjoy this flavourful dish in the comfort of your mud-free home with this dreamy recipe packed with eleven different spices. If you have any anti-vegans amongst your friends, this might be the dish that will change their mind. 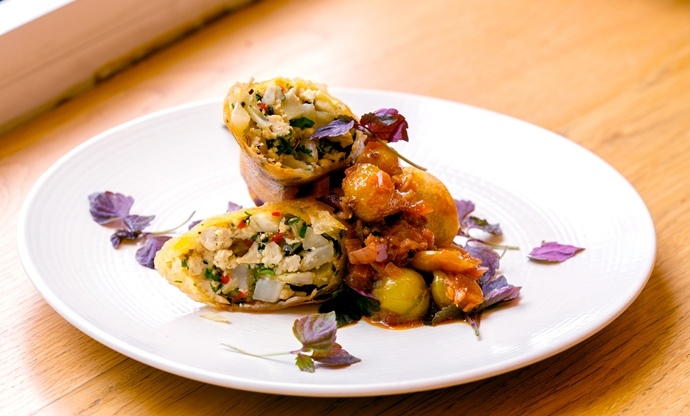 Andrew Wong’s restaurant is one of London’s hottest at the moment and we’ve got the recipes to bring some of his incredible Chinese cuisine to your kitchen table. Spice is the name of the game in this quick and easy Sichuanese aubergine dish which is the perfectly balanced side that your repertoire has been missing. You might need to pick up a couple of ingredients from your local Asian supermarket but once you’ve tried it, you’ll be making these aubergines over and over again. The aromatics in these moreish brick pastry parcels will have you coming back again and again, and the fact that brick pastry is usually dairy-free results in a proper vegan treat. Swap the egg wash for a little water in Anna Hansen’s recipe and you have some seriously tempting fusion spring rolls to impress your next set of dinner party guests. 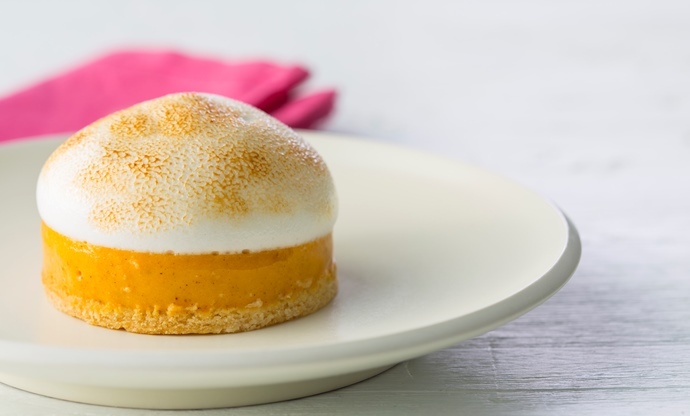 Lemon meringue and pumpkin pies are family favourites which are rarely vegan-friendly but Chantelle Nicholson’s inventive use of aquafaba (the water from canned chickpeas) results in a creamy egg-free meringue which will see happy silence fall on your dinner table. This pud might require a bit of commitment when compared to the normal version, but we can promise it will be time well spent! 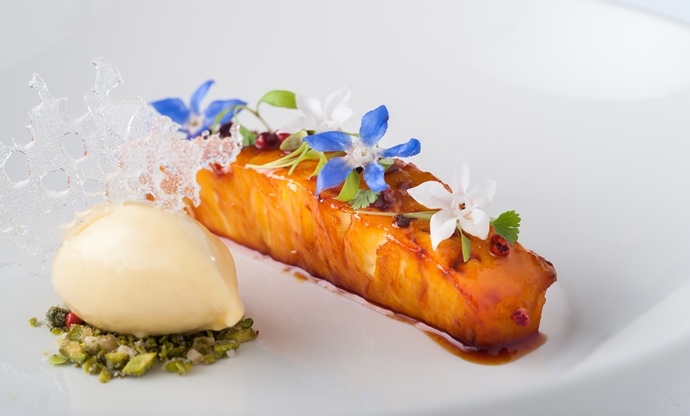 The elegance of Simon Hulstone’s glazed pineapple dessert is undeniable and is sure to knock socks off when you serve it up. Packed with tropical flavour from the spiced pineapple, it also features a stunning egg-free passion fruit and banana sorbet – a real winner for the summer months. The monotony of sandwiches for lunch can become somewhat tedious but Anna Hansen has the answer in the form of her broccoli and endive salad, which can be on the table in just fifteen minutes. 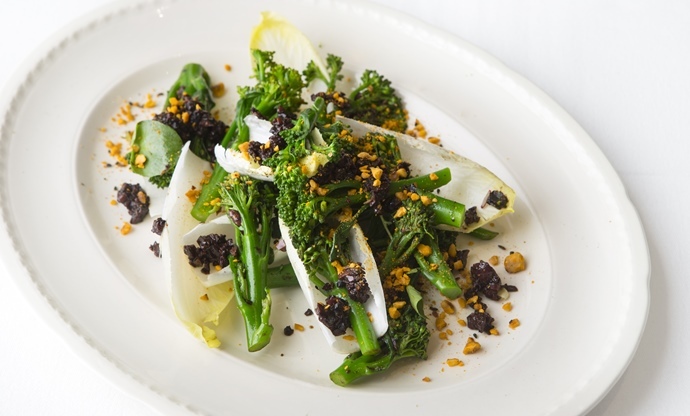 The fresh crunch from the Tenderstem broccoli and slightly bitter endive is deliciously combined with a sticky olive and pomegranate molasses dressing. 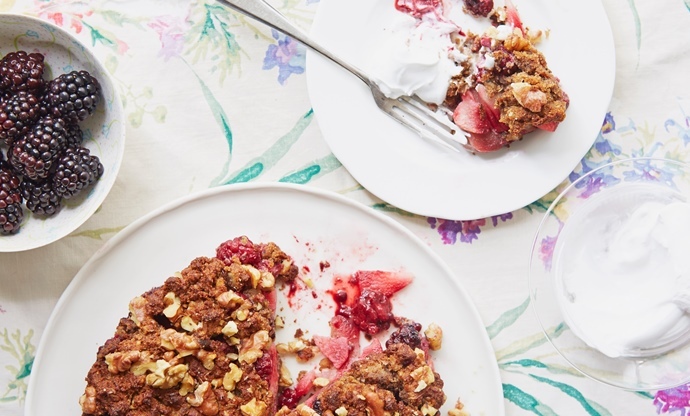 Gluten-free and vegan, Henrietta Inman’s blackberry and apple crumble cake is part-dessert, part-teatime treat which means you can go for a slice at any time of day. Juicy fruit is topped with an olive oil-based crumble which contains plenty of walnuts for a satisfying crunch. Top with a dollop of soy- or almond milk-based yoghurt for bit of dairy-free creaminess. Incredibly crispy, packed with flavour and satisfying, these tofu burgers far from the soggy veggie and vegan options which are often served up. 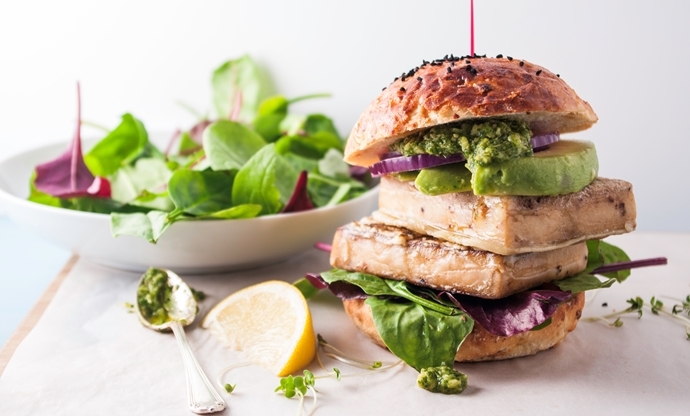 Flavoured with a coriander pesto and creamy avocado, this is the perfect vegan alternative to a beef burger and has plenty of umami flavour thanks to the delicious Asian marinade.